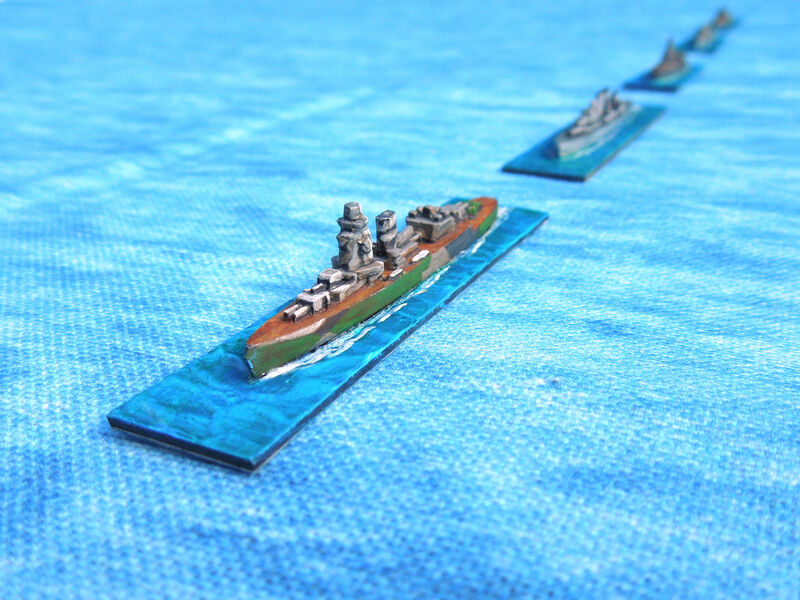 With the 75th anniversary approaching and recent news of maritime grave robbing I turned to the Battle of Java sea for my next naval game. 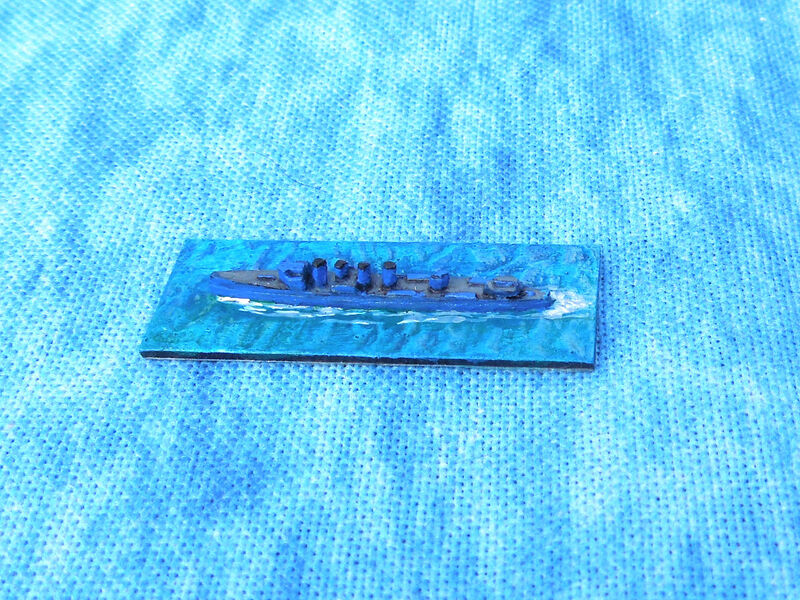 As much of my 1/3000 scale fleets were twenty plus years old and in need of a new coat of paint, and given that I needed a few new additions to round out the OOB I decided to use this engagement to start the miniature refurbishment. The collections is mix of Navwar and Davco models. I prefer Navwar’s castings, a little thinner on the beam but overall crisper sculpts. 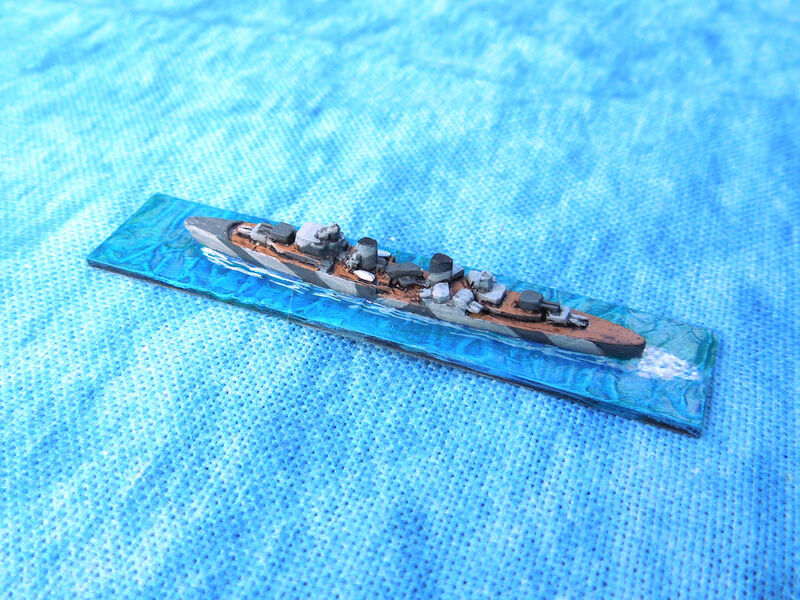 I know there is not much love for 1/3000 with most opting of the more detailed 1/2400, but for me WWII naval is a sub project and I’m happy with the price to detail ratio. The American-Brittish-Dutch-Australian (ABDA) strike force assembled to counter the invasion of the Dutch East Indies was lead by the Dutch Rear-Admiral Doorman. 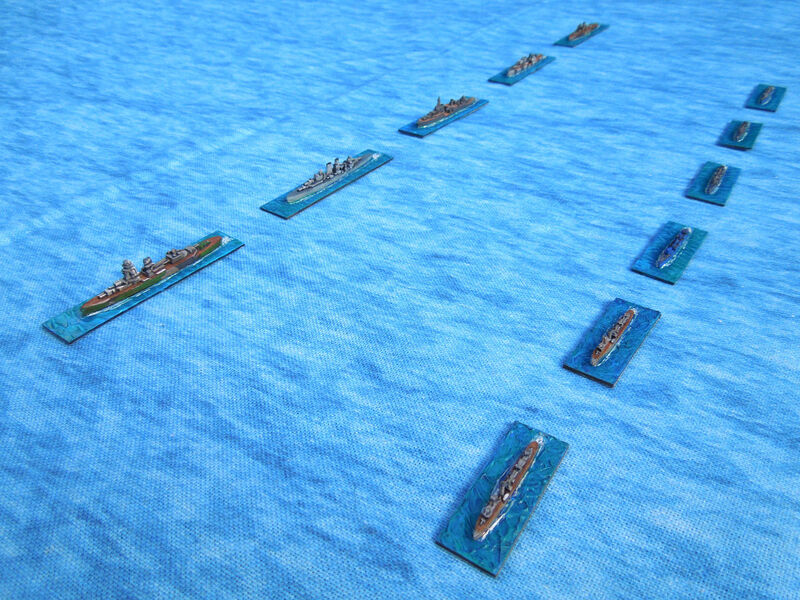 He commanded five cruisers and nine destroyers. Doorman’s orders were to frustrate the Japanese landings on Java, hoping to offer relief to the beleaguered land forces. He organised his strike force into three divisions, a cruiser division, a destroyer division comprising of the Dutch and American ships, and a forward picket of British destroyers. The De Ruyter (Davco) was Doorman’s flagship. 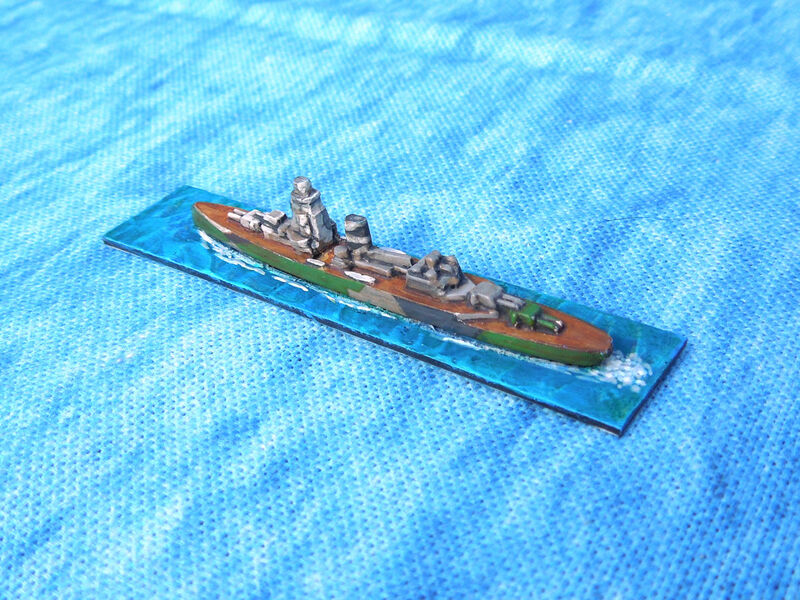 A relatively new light cruiser, laid down in 1933, was armed with 6” guns and poorly armoured. By contemporary standards a weak warship. Economies made during her construction would factor in her loss at the battle from a single torpedo hit. The Exeter (Davco), a York Class heavy cruiser, was the second most powerful ship on the fleet. Identified as such she suffered heavy damage early in the battle forcing her to withdraw. She was sunk two days later in a follow up action. The Houston (Davco), a Northampton Class heavy cruiser was the central power of Doorman’s line. With nine 8” guns (although the aft turret was out of commission due an earlier air attack) it was a match for the Japanese counterparts facing them. Huston survived the battle but was intercepted four days later and sunk. The light cruiser Perth (Davco), was a Leander Class light cruiser modified for the Royal Australian Navy. Fairly modern and armed with eight 6” guns, she survived the battle and fled with the Huston, only to be sunk a week later at Sunda Strait. The Java (Davco) was the other Dutch cruiser and the oldest in the line. Lacking armour with it’s main guns laid out almost in a WW1 arrangement she proved woefully inadequate to the task. She was sunk during the battle from a torpedo launch from a Japanese light cruiser. 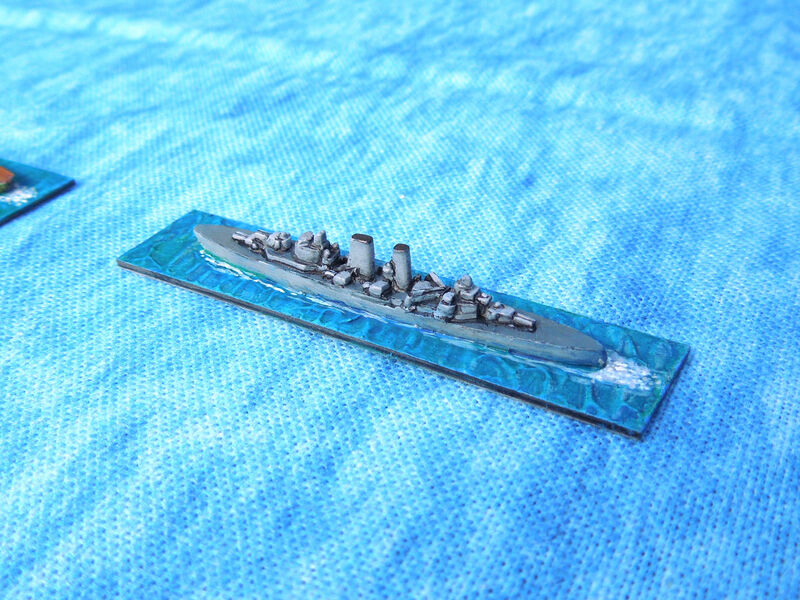 All of the cruisers were capable of launching spotter planes. However Doorman suspected a nigh action and order all air-craft ashore. 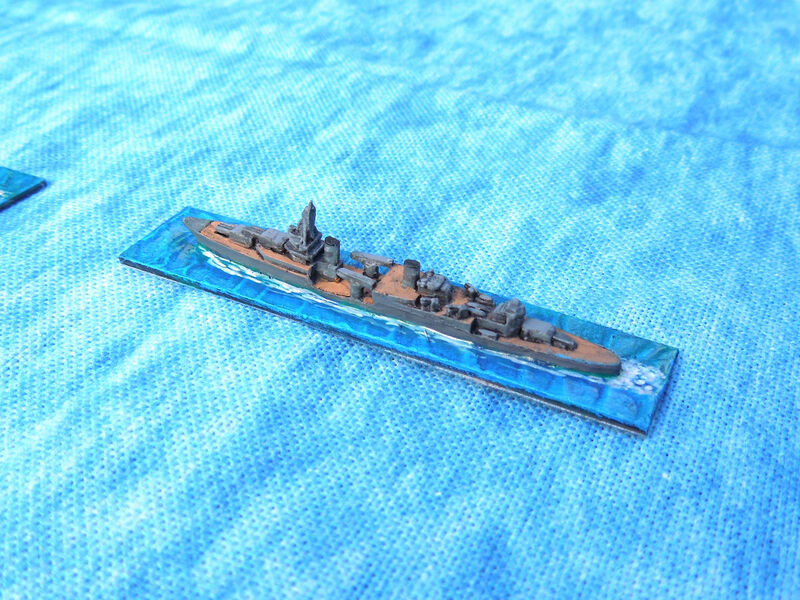 This decision would haunt the Rear-admiral as the allies found reliable intelligence about the enemies position lacking. 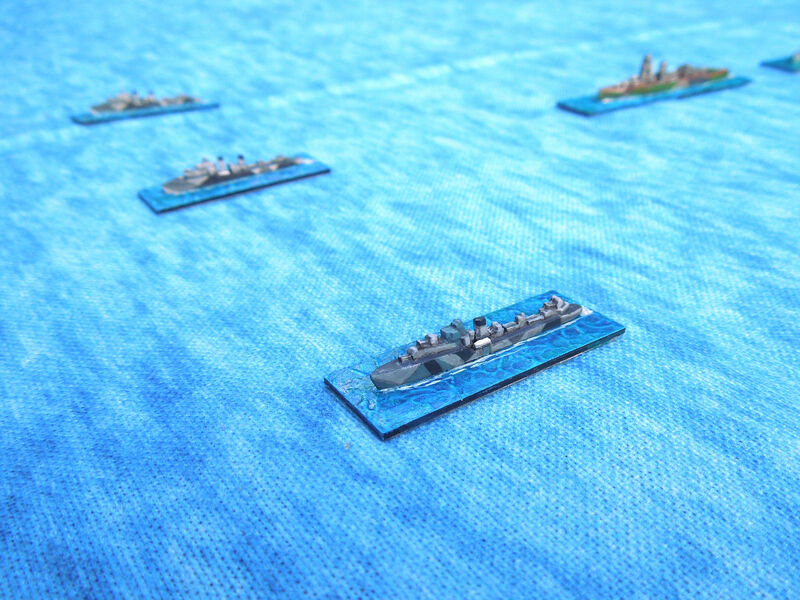 Six destroyers formed in line on the port side of the cruisers. The Kortenear, and the Witte de With (Navwar) are were part of the Dutch naval force, a third destroyer, Van Ghent, was also part of the flotilla but was scuttled two weeks before the battle. These Van Galen Class (aka Admiralen Class) were designed with the co-operation of the British which is evident in their design. Unusual for destroyers they were each fitted with a seaplane that was lowered onto the water for take-off. Four-stackers, flush deckers, Wickes Class or Clemson Class (Davco), these US build World War One era destroyers formed the backbone of the US navy early in the war. In total 272 were laid down with production starting in 1917. Various modifications, refits and arrangements saw then active in every theatre through out the war. Surprisingly only 29 were lost to action. USS Alden, USS John D. Edwards, USS John D. Ford and USS Paul Jones all survived the war. HMS Jupiter (Navwar) J Class destroyer. The crew of the Jupiter has already seen their fill of the Japanese action when they escorted the ill fated Force Z two months previous. The J Class was a shift in the Royal Navy’s previous doctrine, lighter and simpler in design than previous classes they underlined the desire for fast delivery platforms. 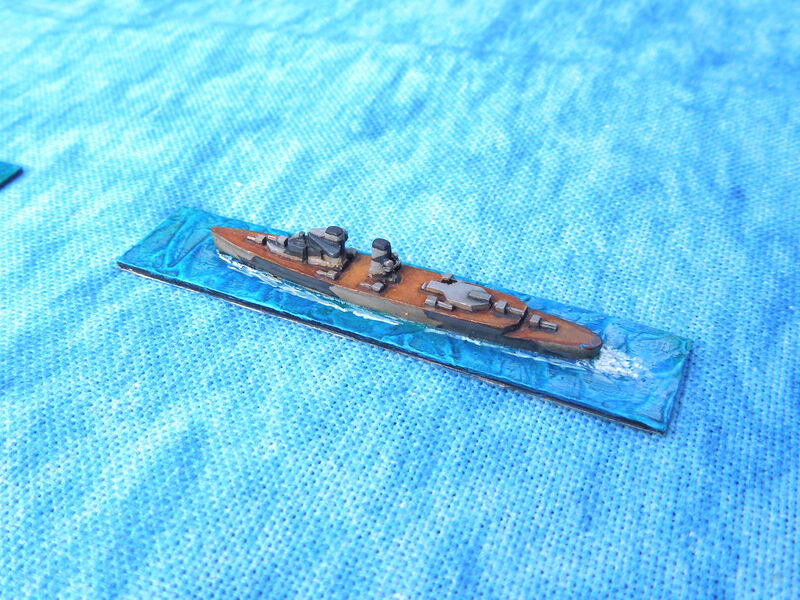 The Jupiter survived the initial engagement only to run foul of the Dutch mine. 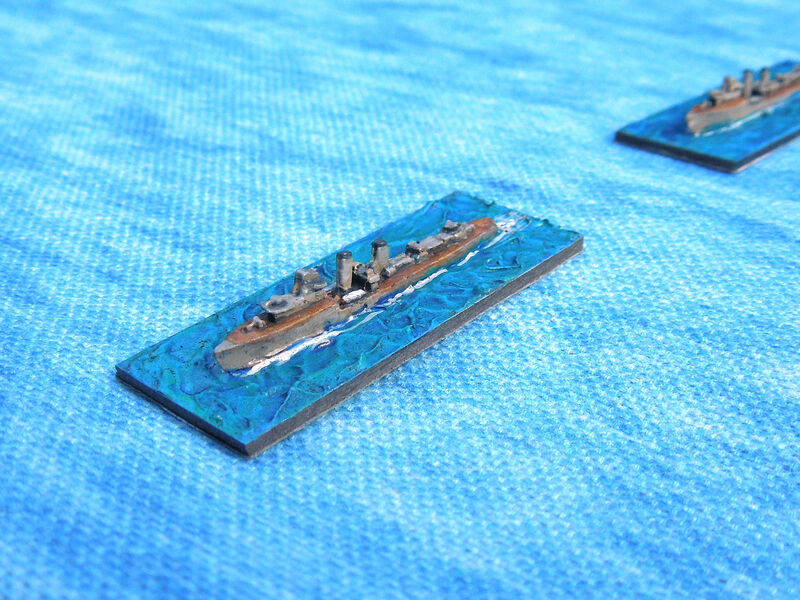 HMS Electra & HMS Encounter (Navwar) E Class destroyers. The E Class destroyers were parts of the 1930’s programme of modernising the navy. Initially assigned to Home Waters they would see service in Spain, West Africa and eventually South East Asia. Encounter was with Jupiter during the losses of the Renown and Prince of Wales. Electra was one of the first ships onsite after the sinking of the Hood resting 3 survivors. She was sunk during exchanges with a destroyer and light cruiser during this battle, while the Encounter was lost the following day during the Second Battle of the Java Sea. I’ll be using General Quarters 3 to refight the engagement. The allies orders are to attack the invasion force beyond the Japanese screen. For each ship with 3 or fewer damage that exits the battlefield to the north awards it VP value divided by 2; also due to a 4:5 disadvantage, all Japanese loses are worth 1.25 times their listed VP.